These Fried Turkey Waffles with Bacon and Maple are a fun way to use up Christmas or Thanksgiving leftovers. 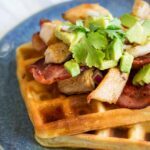 If fried chicken and waffles is one of your favorite breakfasts, then you are going to love these turkey waffles! 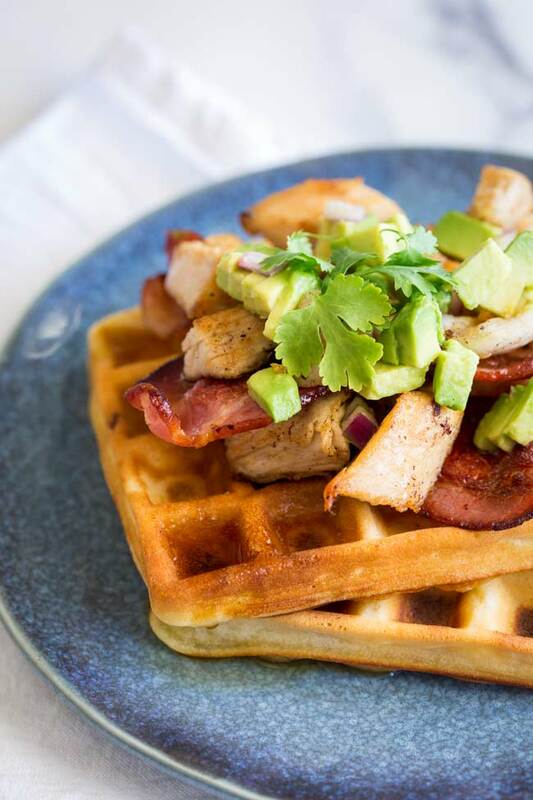 The turkey is fried in bacon grease and served on maple syrup drenched waffles with crispy bacon and creamy avocado. If you are looking for ideas for what to do with leftover turkey then this recipe is going to make your mornings a whole lot better. Yup, you heard me right! Turkey has had a makeover. Here leftover turkey is served for breakfast and it is good! How to fry off leftover turkey. So we spent Thanksgiving and Christmas making sure our turkey wasn’t dry! But reheating turkey can be a problem…. it is so difficult to keep it juicy. For this turkey breakfast, you will want to cook the strips of bacon first. This gives them a chance to sit on kitchen paper and get good and crispy and also means you will have a frying pan loaded with plenty of flavor. We are talking bacon grease/bacon fat. Don’t drain that off!!! It is salty smoky fat that is going to impart so much flavor into our turkey chunks! My preference is for chunks, but if you have already pre-sliced your turkey then slices work just as well. They can be cooked in the bacon grease in exactly the same way and then layered up with the bacon. In fact, slices are much easier to work with when constructing your waffles! Don’t forget the salt in this recipe, it is needed to balance out the sweetness of the maple syrup. Square waffles vs round waffles? Don’t worry, there is no issue with making round waffles. It just happens that my current waffle maker is a square machine. These will work just as well in a round machine. As each machine is different, cooking time will vary. I find around 3 minutes to be enough time to cook the waffles. But check your waffles after 2 minutes and give them longer if they need it. Again because each waffle machine is difference the quantity of batter needed to make a waffle changes. I find this mixture makes 8 square waffles or 4 large round waffles. 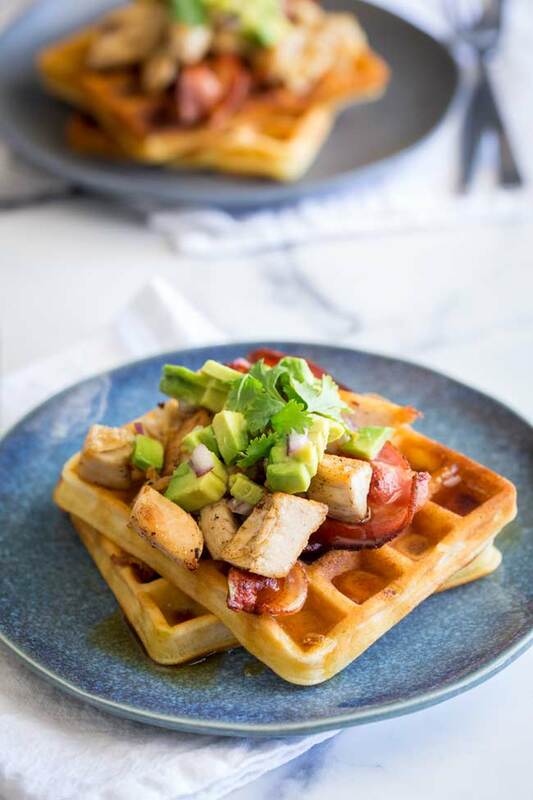 Avocado with maple syrup waffles? I know it sounds a little out there but I promise it really works! The avocado is dressed with lime juice and salt. This helps to stop the avocado from browning but it is also a welcome savory addition to the sweetness of the breakfast. It turns this dish into a sweet and savory combination that so many people love. I like a touch of raw red onion with my avocado but Stew and the kids prefer the onions fried off with the turkey, so go with your family preference there. I like the bite of raw onion, but they prefer them cooked. And please so add the salt, it makes the world of difference! Why not pin this recipe for Fried Turkey Waffles with Bacon and Maple. Pin it here. 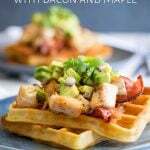 These Fried Turkey Waffles with Bacon and Maple are a fun way to use up Christmas or Thanksgiving leftovers. 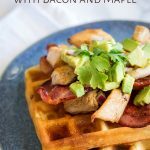 If fried chicken and waffles is on of your favorite breakfasts, then you are going to love these turkey waffles! 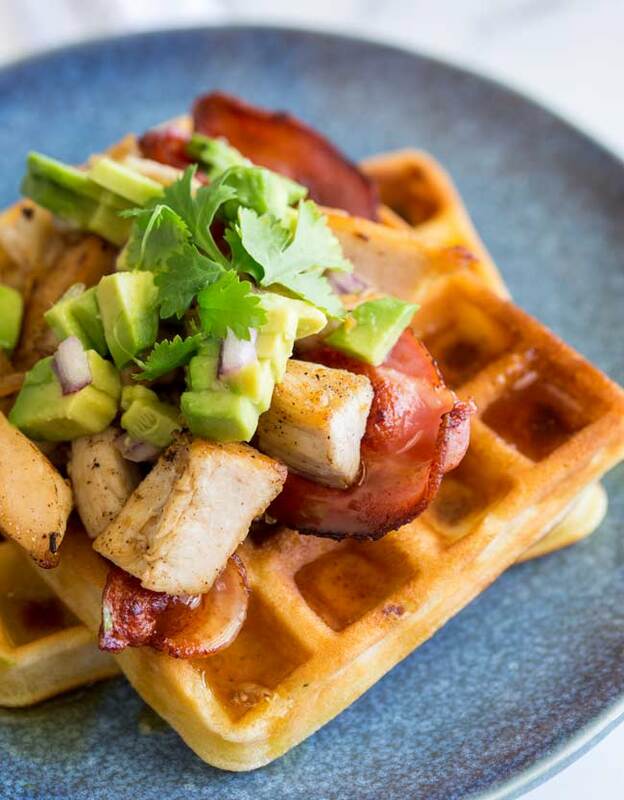 The turkey is fried in bacon grease and served on maple syrup drenched waffles with crispy bacon and creamy avocado. If you are looking for ideas for what to do with leftover turkey then this recipe is going to make your mornings a whole lot better. Start by making the waffles. Combine all the ingredients into a large measuring cup/jug. 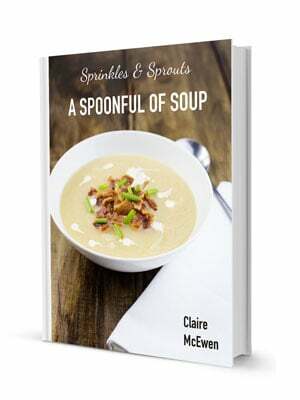 Use an electric hand whisk to combine all the indigents. Lightly grease the waffle machine and then use the batter to make your waffles. Each machine is different, but cook for around 3 minutes until golden. The waffles will crisp up as they sit. Remove the waffles from the machine and repeat until you have used all the batter. Keep the waffles warm in a low oven. Squeeze over the juice of the lime and sprinkle with the salt. Heat the canola oil in a heavy based skillet. Add in the bacon and fry on both sides until crispy and the fat has rendered off. Remove the bacon to a sheet of kitchen paper leaving the bacon grease in the pan. Divide your waffles between 4 plates. Place two strips of bacon on top and then pile on the fried turkey. Drizzle over the maple syrup. Top with the dressed avocado and serve immediately. Raw red onion is quite strong. I love the contrast to the sweet waffles. But if you aren’t a fan of red onion then leave it out or fry it up with the turkey. 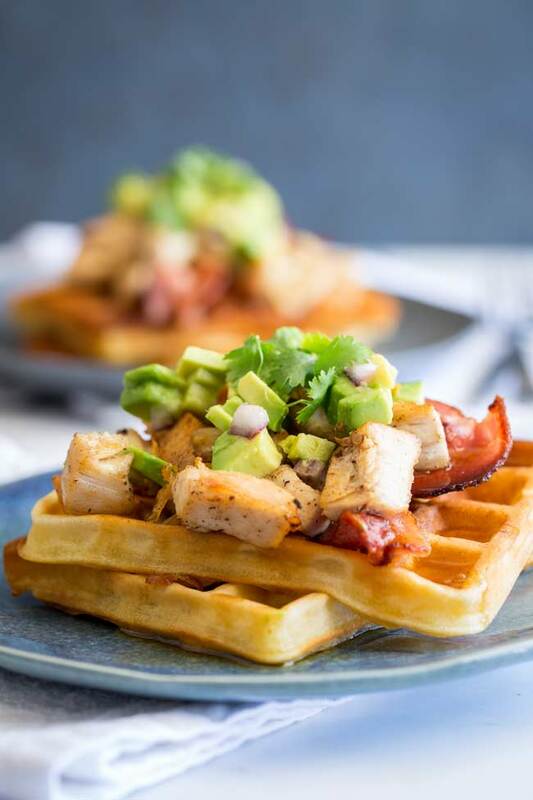 If you love food why not subscribe to my newsletter, I will drop you an email every now and then, just to say hi and send you a couple of recipes I think you might love, like these Fried Turkey Waffles with Bacon and Maple.